And I was only two days late. 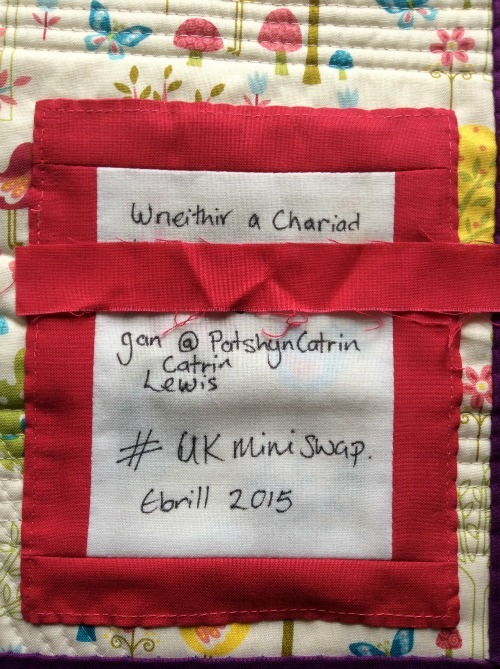 Last time I showed you my #UKminiswap mini quilt it looked a little like this. 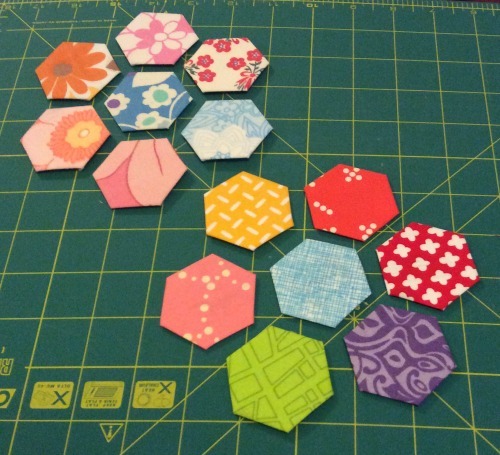 I'd asked on Instagram whether my partner would prefer to have the rainbow hexies or vintage hexies on their mini. The hope was that I would post progress shots of both in order to keep my partner guessing but who was I kidding? I'd left it to the last minute and only had time to make the one mini. I started by basting my background fabric and my backing fabric to some wadding, I know that this might sound strange but I feel that when I'm hand appliquéing having a bit more body to the background fabric makes it easier for me to keep things straight. 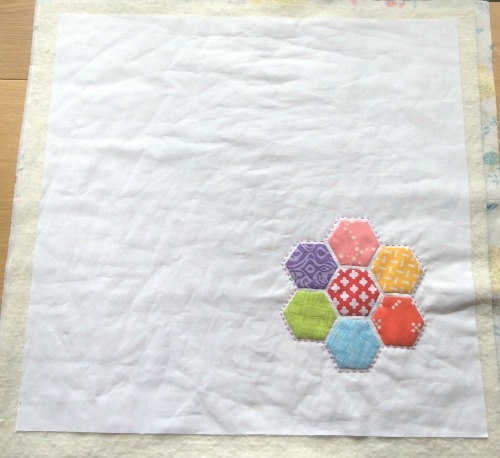 I then used a glue pen to place the hexies before appliquéing them down. I was mainly inspired by this pin on my partner's Pinterest board and Nicole's recent activities. 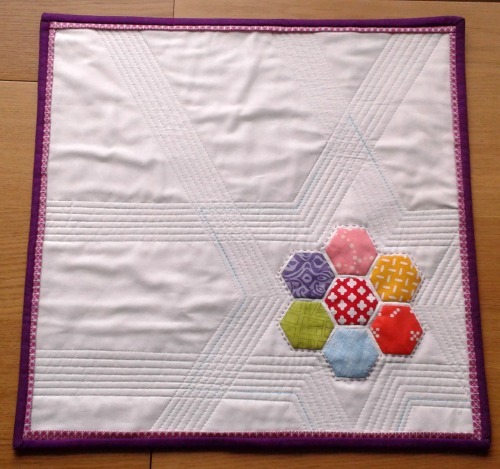 As much as I love Nicole's method of appliquéing the hexies I felt that doing it by hand would give me a bit more freedom to be creative with my quilting. I started quilting by adding one line of hand stitches around the flower using Aurifil No12. As much as I love the effect of hand quilting with Perle No8 I find the Aurifil much easier to work with whilst still giving a similar effect. I then left the mini for a couple of days as I really didn't know how do carry on with the quilting. I half fancied doing some FMQ but since getting the frame I haven't attempted any FMQ the traditional way and didn't fancy spending hours reverse stitching so close to the sending deadline. 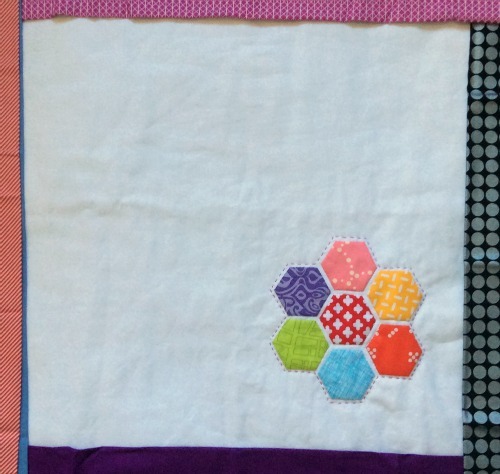 In the end I decided to stick to straight lines with my walking foot using the hexies as a guide. I also used a Hera marker to show where I needed to turn the quilt. After I'd added five lines of quilting I felt that it needed a little something extra. I had a tiny bit of a variegated Aurifil No12 in blue and added a single line of stitches around the star but not to the 'shoots'. Before even starting on the quilting I'd been head scratching about the binding. On the sign up form for the swap we were asked for our favourite designers and/or fabric lines. Out of all those listed by my partner I only had one print! And that was the bias stripe from Scrumptious. 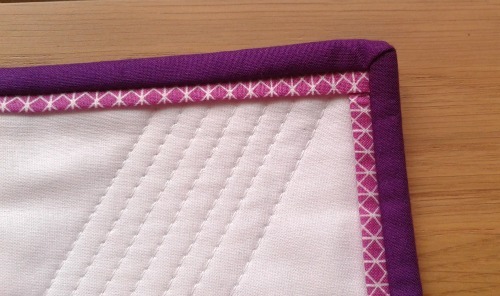 I love a stripy binding but wanted the mini to have a more definite frame so toyed with the idea of adding a 'flange'. I posted the above picture on Instagram and hoped that my partner would choose for me. Unfortunately she didn't comment but the majority vote was for the Dark Violet Kona at the bottom. This is what my gut had told me to go with too but I still liked the idea of adding a flange. Mainly as the quilt was quite simple and I though that it would add an extra little something. In the end I decided to go for the Dark Violet but added a C+S Netorious in Plummy flange. I followed Julie from Jaybird Quilts' tutorial and found it quite easy, however, if I was to add a flange again in future I think I'd start with 0.75" instead of 1" strips as I'd prefer it if the binding was wider than the flange. So there you have it, my finished mini. And I really must say I rather like it. 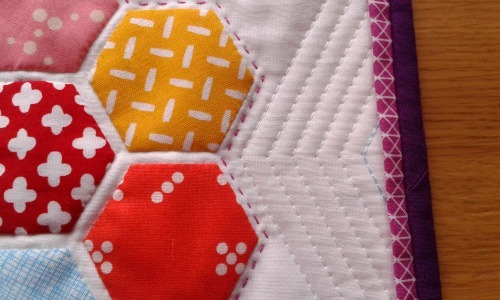 I love the way the dense(ish) quilting around the hexies makes them poofy. I love the extra touch of the hand quilting. And that by carefully trimming the quilt I managed to keep that tiny bit of blue stitching there. And I love that I managed to add a star to the quilting without actually quilting a star. I added a label and to make it a little more 'me' I wrote it in Welsh. Pity I ruined it by forgetting my first name! I've had to cover the recipients name as although I posted it last Friday (the 24th - six whole days ago) my partner still hasn't confirmed that she'd received it. I really hope that this is because it's being held hostage in her local sorting office and not because the idiots have lost it. Or worse still, my partner has received it and doesn't like it so hasn't bothered to post on instagram!!!!! I really, really, really hope that isn't the case as I loved this mini. It's my favourite make so far - a simple design where the quilting is important as the piecing (although there wasn't any piecing in this one, you know what I mean, right?) In fact, I'd say it's the most 'me' thing I've made so far, maybe not such a good thing considering we were supposed to be making to our partner's taste! Luckily I've already got number two ready to go and I'm keeping the next one. All. Mine. Hopefully I'll get around to writing about the little extras I added to the parcel. I enjoyed making them almost as much as the mini itself. Linking up with Shanna and Melissa as this was my April goal for ALYoF. 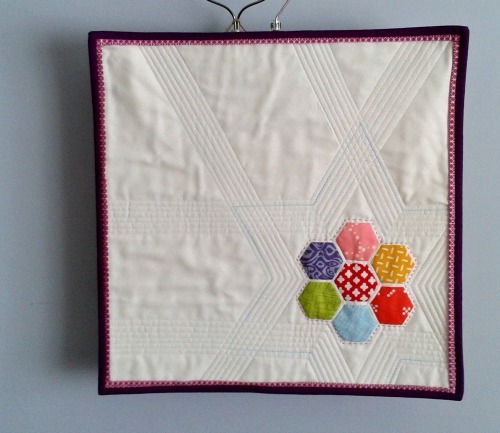 It is lovely, Catrin, the quilting is inspired, I do like the combination of machine and hand quilting! To make a flange narrower than the binding it is also possible to make your binding a bit wider instead of the flange narrower, though then your edge will be more pronounced. It depends a lot on each individual project of course. Everything about it is just right - it's lovely. 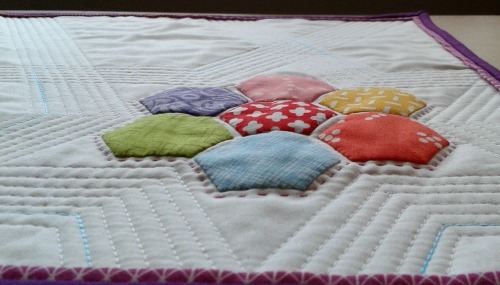 Your quilting is spot on, and your double binding is perfect for it. 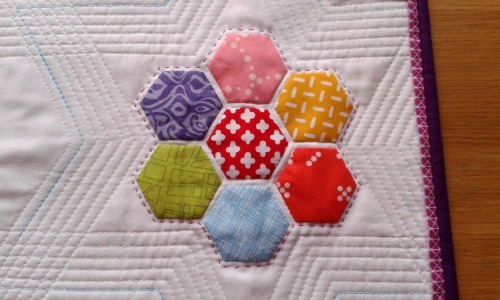 I think it's really lovely - the simplicity is its charm and the puffiness of the hexies is so cute! 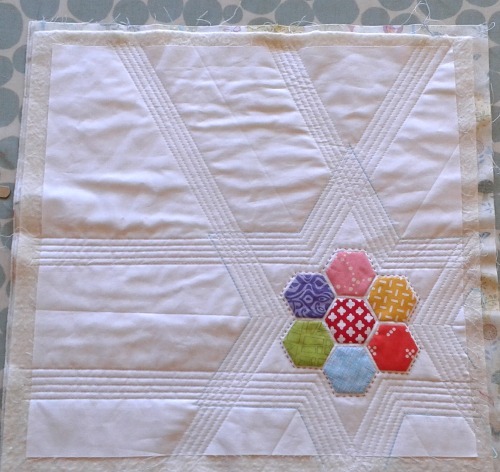 It is absolutely lovely Catrin, the quilting is so perfect for the applique!